Precision Air, has presented three tonnes of food and cooking oil to flood victims in Kyela District, Mbeya Region, who suffered floods following the ongoing rains that left more than 3,983 families stranded. 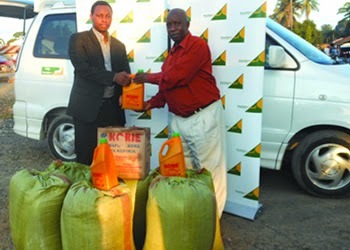 the consignment of relief food donated Kyela flood victims. Precision Air Brand and Marketing Coordinator Hillary Mremi represented the airline’s Managing Director and CEO, Sauda Rajab, in handing over the donation to the Kyela office of Transport minister Dr Harrison Mwakyembe – who doubles as Kyela Member of Parliament. Apart from three tonnes of food, which comprised one tone each of maize flour, rice and beans, the consignment had 312 litres of cooking oil. Tanzania’s leading domestic airline also offered to transport to Mbeya various other donations collected from good Samaritans within Precision Air network across Tanzania. Representing Kyela residents, Dr Mwakyembe said Precision Air had set an example for other companies and stakeholders. He appealed for more donations to support the families now under distress after losing their homes and an assortment of other earthly property. Last week the minister appealed for donation to help the Kyela flood victims, who are sheltered in 14 camps. It is reported that the region has not experienced a similarly devastating incident for the past 60 years. Precision Air has Dar es Salaam as its main hub and operates daily flights to several domestic and regional destinations, including Arusha, Kilimanjaro, Mtwara, Mbeya, Mwanza, Bukoba, Zanzibar, Nairobi and Hahaya in the Comoros.